money to homeless men on the street. Based on past experiences, I don’t think the guy with the sign that reads “Need You’re Help” is going to do anything constructive with the dollar I might give him. Right, because helping people left dead and injured by the hundreds of thousands, as well as starving, without potable water, and homeless, is akin to giving a buck to someone who is homeless–which is often as a result of economic hardship and/or serious physical, mental, and/or psychological problems. Imagine that I’m a caveman. Imagine that I’ve chosen to build my house out of balsa wood, and that I’m building it next to a roaring river because I’ve decided it will make harvesting fish that much easier. Then, imagine that my hut is destroyed by a flood. First of all, kudos on developing the poorest country in the Western Hemisphere. Your commitment to human rights, infrastructure, and birth control should be applauded. As we prepare to assist you in this difficult time, a polite request: If it’s possible, could you not re-build your island home in the image of its predecessor? Could you not resort to the creation of flimsy shanty- and shack-towns? And could some of you maybe use a condom once in a while? 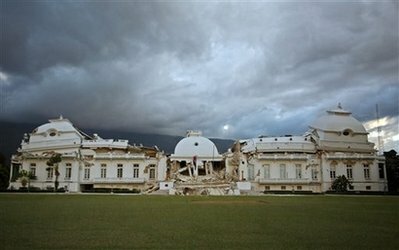 It takes a detestable degree of ignorance to write such screed while ignoring, or simply not knowing even a smidgen of, Haiti’s history–generations of poverty abetted in recent years by brutally restrictive IMF policies mandating the privatization of services, including the police, with private security forces nowhere to be seen in the aftermath of the quake; tariff reductions resulting in the dumping of goods, especially produce, from far wealthier agricultural powers into Haiti that drove out Haitian-grown goods and kept poor Haitian farmers poor; frequent military interventions from the US primarily to forestall democracy, support murderously repressive dictatorships such as those of “Papa Doc” and “Baby Doc” Duvalier, and overtly and covertly support murderous paramilitary groups such as FRAPH. Haiti didn’t simply become and stay poor. It had plenty of help in the last two centuries. Yeah, Mr. Shirley, ignore those crucial details of history and political economy to blame the victims of this colossal tragedy. Thankfully ESPN fired him from his job as occasional correspondent before more such tripe, as well as his grossly ignorant commentary on race in the US that one can read at Salon.com in the above post, could litter its website. Methinks something more is at work with Shirley’s superficial analysis, perhaps the skin color of most Haitians. It would be hard to find a more narrow-minded, selfish, and thoroughly ignorant bookend to Warner among athletes than Paul Shirley. What a disgrace. I also note how he tortuously connects alleged assumptions that the Haitians’ “fate was not at least in part their own responsibility” (after an earthquake, i.e. “act of God”) with a baseless assertion that such this straw-man assumption–to which he attributes to no one–“rationalizes much of the United States’ past meddling in the affairs of Haiti. But most of all, it shows even less respect to the Haitian people.” Really? How does it do those things–rationalizing US “meddling” (a generous and innocuous characterization, to be mild) and showing “even less respect to the Haitian people?” Less than what, “meddling in the affairs of Haiti” which included supporting murderous dictators and paramilitary organization? Really, Mr. Shirley? How can you possibly equate or assess that to then determine the respective harm that the “meddling” and the alleged disrespect of not blaming the Haitians for their poverty had? This, of course, says nothing of economic policies, not disconnected to “meddling,” which Shirley didn’t assess either. Yesterday the NFL lost one of its best quarterbacks and, it seems, people when Kurt Warner retired at the age of 38, after 12 seasons–most of them simply great–for the Rams, Giants, and Cardinals. The fastest QB to 30,000 yards in NFL history, Warner’s story is the stuff of legend–coming out of NFL Europe and the Arena league, during which he stocked shelves in a supermarket; getting a chance to play when Trent Green went down with a knee injury; leading the Rams, the “Greatest Show of Turf,” to a Super Bowl victory then back the next year before losing in New England’s upset win; two-time MVP; taking Arizona from perennial doormat to the doorstep of football immortality with a great game against the eventual champion Steelers; the three games with the highest total passing yards in Super Bowl history; a lightning-fast release reminiscent of Dan Marino and Dan Fouts; great accuracy and precision in timing; seventh-most passing yards and fourth-most TDs in playoff history–in just 13 games, easily the fewest of those atop the list. And the guy didn’t become a starter until the age of 28. Amazing. Just as amazing–how many people walk away from millions of dollars while still at the top of their games? Not many. I can’t say that I agree with his religious views or his conservatism. But it is impossible not to admire the man’s generosity and decency. The guy has donated millions as well as countless hours to charities and foundations, including for developmentally disabled children. He’s a genuinely humble, decent man, and there should be far more like him in life, not simply in football and sports. How many untoward words about Kurt Warner have you heard? How many times has he bad-mouthed teammates? How many times has he been a public spectacle? I literally can’t think of a single instance of any of those things. Hall of Famer, as a player and person. According to Baseball Prospectus via Chad Jennings, PECOTA projected the Yankees to finish third in the AL East–with the third-best record in baseball at 93-69–and to score 917 runs while allowing 789. This would be 60 more than they project the Rays to yield. Sorry but, barring a rash of Yankee injuries, I’m not buying it. The Yankees are pretty well stacked, have an experienced team in place, and happen to be the defending World Series champs. My modest coin is on them. The Rays are talented, but I’m not sold on the likes of Sonnanstine by any stretch yet, and he’s hardly the only wild card among their pitchers. Projections are swell for some things, but that’s why baseball gets played. I myself put little faith in these, regardless of their outcomes. With the signing of outfielder Randy Winn, the Yankees officially ended JD’s four-year stay in pinstripes by inking Winn to a one-year, $2 million deal. Honestly, this signing would leave me with little more than a yawn as a reaction were it not for its implications on a still-uncertain left field situation, and the lingering questions remaining about the degree to which the Yankees can successfully replace the offense JD and Matsui provided. With his best days well behind him, Winn will be expected to provide some bench depth and will likely play some in left and, in a pinch, possibly a little right field, where he spent most of his four-plus years with the Giants. A nice career hitter (.286) who still possesses some speed (stealing 56/63 the last three seasons), Winn will be an asset on the base paths when he plays. However, the question at this point in his career is how often will he get on base? Winn’s productivity drastically tapered off last season, in which Winn hit a mere two homers and drove in 51 in 597 at-bats. His average and OBP also dipped to.262/.318 last year from .306/.363 in 2008, and .300/353 in 2007, in no small part from his abysmal .158/.184, with 0 homers and 8 RBI in 120 at-bats, against lefties–against whom he is a career .280 hitter. This isn’t a completely useless signing, for Winn’s speed does matter on a team still possessing an older lineup, and he’s a decent and versatile outfielder. But I still can’t help but ask myself if this was the best the Yanks could do for another outfielder. I know it’s easy for me to tell the Yankees what to do with their money–and this clearly indicates a somewhat concerted effort to stay within the budgetary parameters they laid out–but Winn’s signing would have been less objectionable to me had the Yankees kept Matsui, who signed with the Angels for one year and $6 million. Other than the possibility that Matsui’s knees are even worse than he and the Yankees heretofore let on, thus making him a continued considerable injury risk despite his prodigious bat, could the Yankees really not have re-signed him for one year, $6 million to DH instead of Nick Johnson, who couldn’t outrun most regular readers of this blog around the bases, who gets hurt often, and whose own power has tapered off? I’m not convinced. Bad knees and all, Matsui to me was still a preferable alternative to Johnson at DH, and not keeping him this off-season was the real sin. That to me underscores the real issue I have with some of the Yanks’ off-season moves–they’re gap fillers. Johnson is a gap filler; so is Winn. Now, Winn’s being so is understandable, for he is who he is; Johnson’s less so. The combined presence of the two–and neither JD nor Matsui–rankles me. The Yankees lost 52 homers and 172 RBI and, while Granderson if healthy will undoubtedly make up for some of that while also covering for Melky’s departed 13 HR/68 RBI, expecting Johnson and Winn to account for, say, 30 homers and 130 RBI combined seems to be asking a lot. I’d be downright shocked if they approached that. It could well be that JD’s and Boras’s demands were too high for the Yankees, who may not only have wanted to keep payroll in check but also may not have felt that JD in the next couple years would have warranted the $13 million per year he received for the previous four–in which he was very productive, a likable guy, and who helped make the Yankees considerably less uptight. I’m just unwilling to take sides in the negotiations for, in sports, agent-player-team negotiations are to a good degree kabuki. Given the sordid history of collusion in the 1980s, I’m also not convinced that there isn’t some collusion occurring now–so many free agents dangling after a few months, so much low-balling free agents to salaries so consistent as to parallel local gas stations that, despite differentiated ownership, mysteriously offer exactly the same price for a gallon of gas. Nevertheless, my hope–not entirely unreasonable or seemingly unaffordable–was for the Yankees to at least retain either JD or Matsui primarily to DH. Neither will do that, and Matsui it appears was the more attainable or, pardon the rhetorical concoction, retainable. In his and JD’s absence, banking on Johnson and Winn hardly inspires confidence in me. One can, however, read much into it. As mentioned earlier, the Yankees seem to be paying more than lip service to a loosely defined self-imposed cap on salaries, at least for this year. They may also be thinking that, with a very stacked team, they can platoon Gardner with Winn, or have Gardner start outright, take the improved defense in left–which includes Winn, who would certainly be better than JD–and accept whatever offense the aggregate left field position yields in the best lineup in baseball with Jeter leading off, Teixeira and A-Rod anchoring 3-4, Posada, Cano, Granderson, and Swish. To some degree, I can accept that too, except for the possibility that injuries occur and, God forbid they do, having Matsui and/or JD to supplement the loss of others would have been far better than Johnson (who can play first if Teixeira [gasp] falls) and Winn. That is, the theory that the Yankees can accept two possible fourth outfielders manning LF works as long as the rest of the lineup doesn’t just produce, but stays healthy. That would be great, but is no given. Barring yet another outfield acquisition–and remember that Jamie Hoffman still lurks somewhere in the organization and, I hope, gets a legitimate shot at making the club–it seems that Gardner is slated to play LF. While I mainly feel iffy about that because he has thus far been inconsistent at the plate, a good part of me wants Gardner to get a crack at it. His speed is simply irreplaceable and, when he is on base, he is downright disruptive. If he were to get 500 at-bats and hit, say, .270/.335, he should steal 45-50 bases. That’s a lot, especially on a team that in the last six years has only had two seasons with a player with 30 more stolen bases–both of them from Jeter, 34 in 2006, 30 last season. I love the speed that Gardner provides, but he also needs to show in 2010 his historic propensity to adjust to each level, as Chad Jennings (who I think is tremendous at LoHud) said a while back. For Gardner in 2010, that means recognizing pitches better to prevent getting behind 0-2 and 1-2 so often, preventing looking at called third strikes by being a little more aggressive, ensuring he has level swings to split gaps and let his great speed take over, and continuing to learn about hitting from Kevin Long, and about reading pitchers. If he can do that, he can be in 2010 for the Yankees what Melky was in 2009–a solid contributor on a stacked team–if not more. Not to be overlooked is that, if he starts in left, the Yankees’ defense will be markedly improved. Gardner’s defense will undoubtedly be there, which should make the Yankees much better defensively in the outfield; the Yankees need his offense to be better if he will be the everyday left fielder. Yet while I love JD’s bat, demeanor, and clutch hitting, we must peer back through the halcyon fog of the great World Series win and his Game 4 heroics to recall that he outright dropped three balls, three cans of corn, last season alone. Still blessed with good speed, he failed to track down some balls in left center that he would have a few years ago. Still clutch and game, his legs came up lame in the Game 6 clincher of the World Series–not the first time he left a game with leg cramps or some such ailment. If healthy, Gardner and Granderson will more than adequately cover the deep LCF. Plus, Gardner tends to judge and track balls very well–very well. The dude flashes the leather, and that will save the Yankees some runs. It also says to me that, even if Gardner has a fairly good 2010–and I hope he does–the Yankees will still make a serious run in the 2010 off-season at Carl Crawford as well as a starting pitcher, which may well be Cliff Lee. Something about these moves, which I admittedly question if not outright disapprove, bellows that the Yankee are biding their time–with a pretty damn good team which just so happened to win the World Series last season, ahem–to further stack the deck. Maybe I’m wrong, and I’ll be the first to admit to the perennial man-crush I’ve had on Carl Crawford. But something about these moves cries save a bit now, pay out later for Grade A. If that were fueling Cashman, who despite my head-scratching about Johnson and Winn pulled off two sterling moves for Granderson and Vazquez, OK. In the meantime, however, we’re left to dissect and digest moves–shedding JD and Matsui and acquiring Johnson to DH an Winn for some OF role–that for good or ill will certainly play a key part in the success of the Yankees’ lineup in 2010. I am trying to think optimistically about Gardner, for the guy still has some untapped potential that I would love to see realized in 2010. But the acquisitions of Winn and Johnson just don’t sit well with me at all. …until pitchers and catchers report. Although I’ve been busy, I’ve been getting a strong itch for baseball. Surely, I’m not alone. With massive, widespread devastation in Haiti after the earthquake, please consider making a donation through local agencies or, if possible, Doctors Without Borders. The people in Haiti, really, really need it right now. I thought for a few days about blogging on Mark McGwire’s confessing the obvious–that he took steroids and HGH, particularly during his run for the single-season home run record in 1998 but also well before that. I hadn’t seen his teary-eyed interview on TV, watching clips instead via the Internet while reading some of the back-and-forth on ESPN about his future chances for the Hall of Fame. I thought about waiting to write about him and his steroid use after a stretch, to perhaps be more circumspect and maybe more evenhanded about him and that time than I am now. McGwire is obviously now as guilty of taking steroids than others who were caught through tests and/or accusations, or who made their own teary mea culpas before an increasingly annoyed American sporting public. Yet he also has the whiff, just like A-Rod, Bonds, and Palmeiro, of publicly, vehemently, and repeatedly denying he had used steroids only to have to confess to it, or to have been revealed through positive tests to have been a thorough-going liar. He also had the gall to snivel with self-righteous pain and anger at the reporter, who happened to have two functioning eyes, some inquisitiveness, and at least a little sense of journalistic integrity to muster the temerity to ask the obvious questions–hey, Puffy McRoidBoy, what is that bottle of andro sitting on the top shelf of your locker for everyone with a modest attention span to see, and what are you doing with it? Moreover, he claimed in his interview with Bob Costas that he used steroids merely for “health purposes.” What a canard. Steroids actually taken for health purposes are typically prescribed in doses far below the jacked-up concentrations that players take, regardless of McGwire’s insistence that he only used “low-dosage” steroids. I also must have missed where McGwire clandestinely accumulated extensive medical training for such a diagnosis and self-serving retroactive justification for illegally abusing drugs. Oh, he might have taken them after some medical issues, just not merely for medical issues. McGwire had a chronically bad right knee. He barely played in 1993 and 1994, and even missed some time in the strike-turned-lockout shortened 1995 season, then missed 32 more games in 1996. Among other likely reasons such as desiring fame and fortune, McGwire took steroids to stay on the field, especially in an era when home runs were flying out of stadiums and salaries began to rapidly escalate. I believe that he took steroids to ensure that he was a part of that. If such conjecture about Bonds’s motivations for steroid use (mostly famously espoused in Game of Shadows by Mark Fainaru-Wada and Lance Williams) is fair, then it also is for McGwire, who happened to make roughly $59 million of his career earnings of $74,688,354 million from 1995 when he recovered from injuries thanks to steroid use, by his own admission, and used them during the most productive years of his career. More about this below. *He hit 245 homers from 1996-1999, when he was surely taking steroids during much of that time, thus directly tying his most productive home run seasons to steroid use. Crucially, these years, as well as his 2000 and 20o1 seasons when he added 32 and 29 homers, respectively, occurred after he missed over 240 games from 1993-1995. That is, there is a very serious question about how much McGwire, who turned 32 at the end of the 1995 season, could have played after that and, therefore, how productive he would have been and for how long. Others such as A-Rod and Bonds have similar questions surrounding them, but were extremely and consistently productive before known or strongly suspected steroid use and, to me, were sure-fire Hall of Fame players before abusing steroids. *It isn’t as though McGwire simply used steroids in 1998. He admitted to using them intermittently throughout his career, allegedly dabbling in them as early as 1989 and 1990, then again in 1993. “I remember trying steroids very briefly in the 1989-1990 offseason and then after I was injured in 1993, I used steroids again,” McGwire said in his statement. “I used them on occasion throughout the ’90s, including during the 1998 season.” This calls much of his career into question, starting with 1995 when he hit 39 homers in just 104 games, as well as 1996 (52 homers) and 1997 (58 homers). From 1995 to the end of his career in 2001 was when McGwire hit 345 of his 583 career homers (59.18%), exactly during the period of his most concerted and acknowledged steroid use. *Was McGwire that great a player? Sure, he hit 583 homers, most of them likely on steroids or stemming from steroid-induced recovery from injuries by his own admission. But look at his overall game. He was largely a one-tool player, winning just the Gold Glove in 1990 when due to a bad back, Don Mattingly played fewer than 100 games at first and didn’t win the Gold Glove (remember this as Tino was robbed of the Gold Glove in 1999 by another steroid abuser at first, Palmeiro, who played all of 28 games yet hijacked the award). He hit .263 for his career, with 583 of his 1,626 career hits being homers (35.85%), and most of those long balls in some way resulted from steroid use. In fact, one could make a good case that his mediocre career average of .263 was only that good because of steroid use, for McGwire hit .278 (792/2,845) from 1995 onward, which followed when McGwire admitted to using steroids to allegedly recover from injuries. So, for the first part of his career, when he by his own admission used steroids but seemingly less frequently, he hit a mere .250 (834/3,342), and 238 of his homers. That’s hardly Hall worthy. *Note the vagueness in McGwire’s admission of steroid use–“on occasion throughout the 1990s.” This hurts him, especially during a period without testing, especially when his home run totals drastically increased again after his injury-shortened 1993 and 1994 seasons. That won’t help him, nor should it, when people evaluate his career. *Roberto Alomar to me was robbed of being a first ballot Hall of Fame inductee when he received 73.7% yes votes in 2010, likely because of the incident in which he spat in John Hirshbeck’s face in 1996. Yet it was pretty clear that, horrible though Alomar’s behavior was in that incident, Hirschbeck was no saint either, goading Alomar and engaging in base name-calling (either an ethnic slur which Alomar claimed, or a homophobic smear, which is what I think occurred). This in no way excuses Alomar, who was clearly and I think sincerely contrite for it soon afterward. Alomar was far superior to and much more well rounded a player than McGwire, and was publicly a bigger person–apologizing for the incident, the harsh words said afterward about his Hirschbeck maybe being affected by his son’s death from ALD, publicly shaking hands with Hirschbeck and even helping raise both money and awareness of the dreaded disease. McGwire, on the other hand, denied using steroids for years, insulted with his roided-up “accomplishments” in 1998 the Maris family and the legacy of Roger Maris (who hit 61 homers in 1961 both without PEDs and under great duress from a scrutinizing hostile media and public), refused to answer direct questions before Congress about steroid use, then finally confessed to steroid use at various points in his career simply because he got a job with the Cards, and would have faced even more scrutiny as the season began and wound on. McGwire, to me, has acted far more dishonorably and duplicitously than Alomar, his superior on the field. McGwire simply doesn’t deserve enshrinement in the Hall of Fame, not as a player or a person. It is also long past time that people, especially the often short-sighted sports punditry, shed the thinking of 1998 as the year of McGwire and Sosa, another likely steroid abuser who also corked his bats. This was the case at the time, certainly for me and Frank the Sage, but is all the more obvious now, that by far the grandest achievement of 1998 was the Yankees’ winning 114 games, and finishing an incredible season 125-50, with the serendipitous .714 winning percentage as an homage to that great home run hitter, Babe Ruth. The great achievements of that tremendous Yankees club are the clear, unsullied benchmark for that historic year in baseball, not the tainted accomplishments of a puffed-out, juiced-up, self-serving, one-trick mule and his equally tainted Cubs sidekick.